At this weekend’s South of England Athletics indoor age-group champs, Zahara Malcolm was 4th in the U15 girls 300m in 42.87 secs, having qualified third fastest for the final in 42.85 secs. Shona Vincent had been ranked 5th U/15 Girl in the UK at 60m going into the championship after 7.92 secs in the previous weekend’s London Games. She qualified comfortably, with 7.94 secs in the semi-final, but a poor start meant she finished 5th in the final (8.01 secs). In the U/17 mens 60m Merveilles Massembo ran a PB of 7.29 secs in the heat and improved to 7.25 secs in the semi-final but missed out on the final. 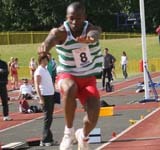 In the long jump Samuel Oshodi finished 13th in his first competition in the U/17 age group. U/20 Amelia MacDonald finished 11th in the pentathlon at the England Athletics championships in Sheffield on 5-6 January. Her performances included a high jump PB of 1.64m, and 5.48m in the long jump, as she added over 200 points to her best score with 3317. Among other notable indoor performances, Cameron Fillery’s 7.92 secs PB over 60m hurdles at Loughborough on 12 January topped the early season national rankings. In meetings in the US, Cindy Ofili opened with a 7.50 secs flat 60m and also 24.78 secs over 200m, while Gabriella Ade-Onojobi ran 8.52 secs over 60mH.